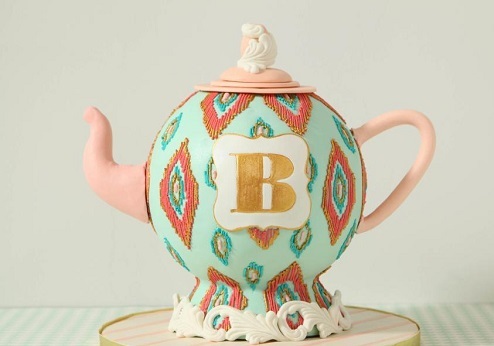 A teapot cake brings a wonderful surprise factor to any tea party or birthday celebration. The tradition of afternoon tea has made a welcome return and has been embraced as enthusiastically by the younger generation as well as the older generation and makes a superb party theme. 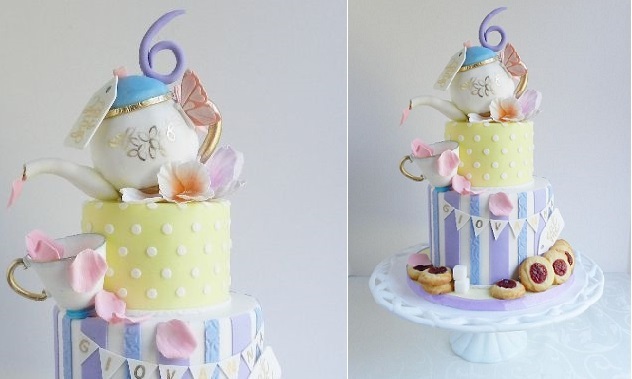 And what better way to bring the theme to life than with an actual teapot cake?! Also see How To Cakes multi-tiered teapot and teacup cake and tutorial featured further down. Our two beautiful feature cakes above are by Australian cake designer, Lorinda Seto (top left) and the UK’s, Cake Matters (top right). Royal wedding cake maker, Fiona Cairns, features a beautiful teapot cake design in The Birthday Cake Book , similar to her beautiful pale blue design below left. We also have an exquisite teapot cake (below right) by Slice Custom Cakes, with the teapot cake showcased atop a vintage blue petal-shaped cake, which makes a very pretty and elegant combination. 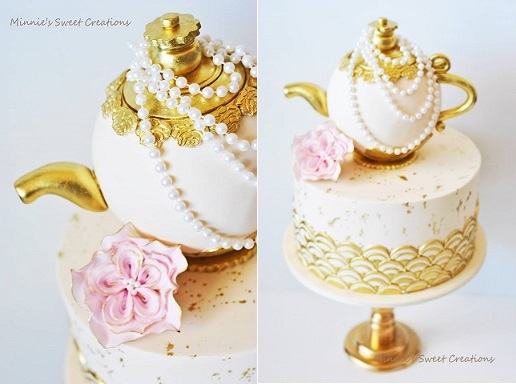 You can add as much detail as you wish to your teapot cake design, adding gold edible paint for a gilded gold finish similar to the majestic example below left by Nice Icing. Or you can add an elegant floral applique design like the exquisite design by Cakes Décor contributor, Sandra Caputo, below right. Below, an ornate antique teapot cake with art deco side design by Minnie’s Sweet Creations perfect for a Gatsby style vintage tea party. 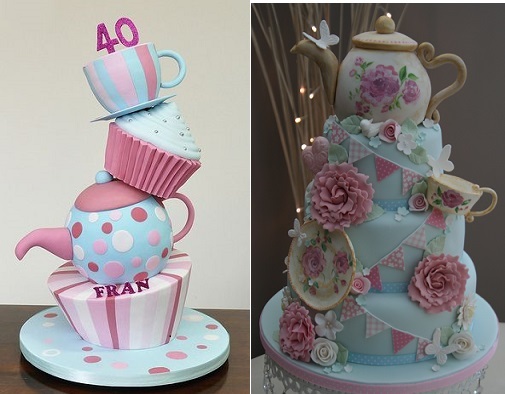 For the more adventurous, How To Cakes provide a tutorial on the multi-tiered teapot and saucer cake (below left) for a 40th birthday. 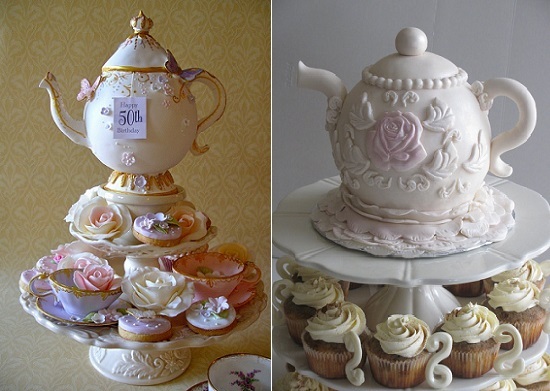 Katie’s Cupcakes (UK) have designed a stunning multi-tiered teapot cake (below right) draped in vintage bunting that would wow any afternoon tea themed wedding or party. Our final cake is a very pretty whimsical style teapot cake from The Cake Whisperer, complete with jammy scones – a lovely touch for a vintage afternoon tea party cake. 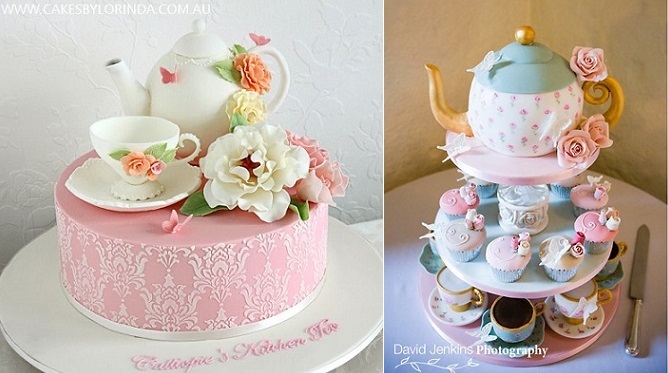 See Teapot Cakes – Part 2 for even more beautiful cake designs. Plus, for more on vintage teacups, see our feature on Teacup Cake Toppers. Advertisement: Craftsy have an excellent tutorial from Mary Maher of Chicago’s famed, Cake Girls, teaching how to carve, sculpt and support three unique teapot cake designs, the ikat patterned teapot cake below. You’ll find all details here: Charming Teapot Cakes – A Cake for Every Occasion. For more on the latest cake trends, check out the: Cake Geek Magazine Facebook Page.